I recently relocated and I really missed the convenience of having wired ethernet in each room. Sure I have an that does 802.11ac, but I still have some devices such as TiVo Mini (review coming soon) that require a hardwired connection. Yes I could go with or, but nothing beats gigabit ethernet if you can do it. The challenge was running a cable from living room to my office, from my living room to my master bedroom and not being able to see the cables once in place. 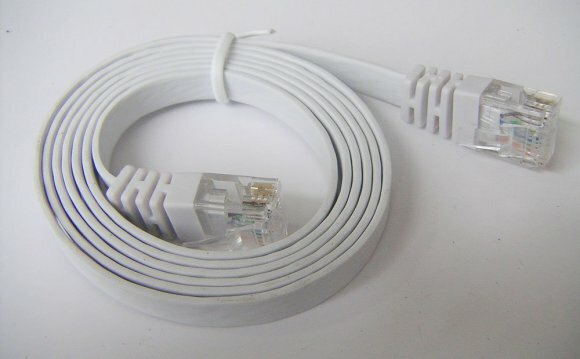 Category 6 Ethernet cables are traditionally thick and well, ugly. Sure you can get them in different colors or paint them, but they are still very very noticeable. Some even run them under the carpet or rug and still see a “bump”, not to mention eventually wearing the cable out with foot traffic. My plan was to take the longer route along the wall and baseboard, but tucked in and out of sight. To do this I needed a “flat” ethernet cable. I ended up going with a couple of . Although I love buying cables from as they are almost always cheaper, but they only had black ones and at some point the cable does need to come up from the floor and attach to something. White would just looked better and less noticeable than a black cable since the point was all about hiding it. Once installed the cables performed just like regular Cat 6 Ethernet cables and I’m happy to have a more secure network that is faster than the fastest WiFi. Although gigabit speed is not a concern for TiVo or Apple TV since they don’t even have gigabit ethernet ports anyway, it’s nice in my office where my is plugged in while I work and getting gigabit speeds via my to as well as my .